All that really means, friends, is that Friday will come a day early this week, in my mind. I made this this weekend. I made it for myself and it was REALLY good. 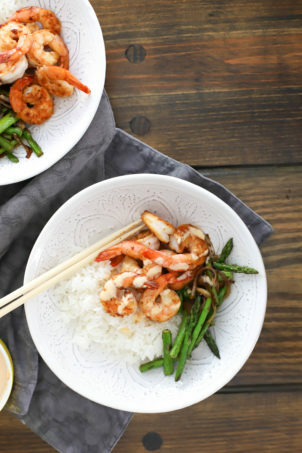 6 ingredients plus salt and pepper – and ready in 20 minutes or less if you use the microwave. Also, it’s DELICIOUS. 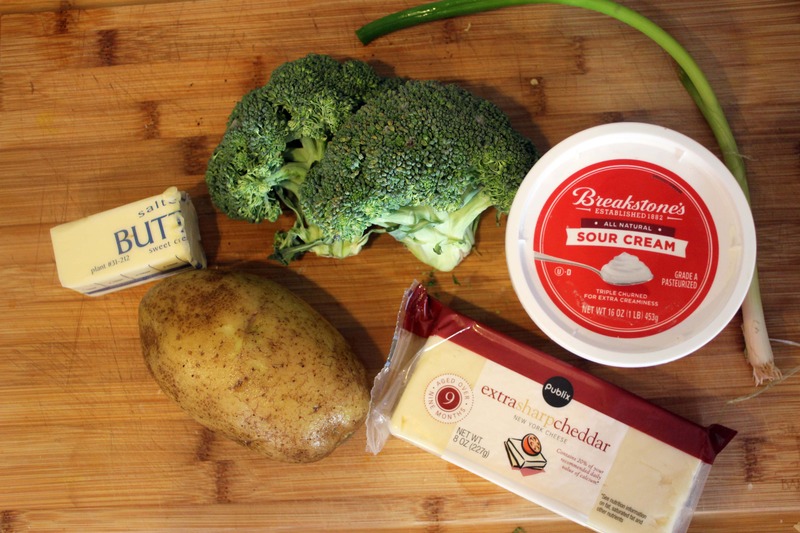 We all love broccoli cheddar soup, right? And remember this broccoli cheddar risotto? What I mean is, the flavor combo is just really delicious, and so I want to have it in lots of different ways all the time. 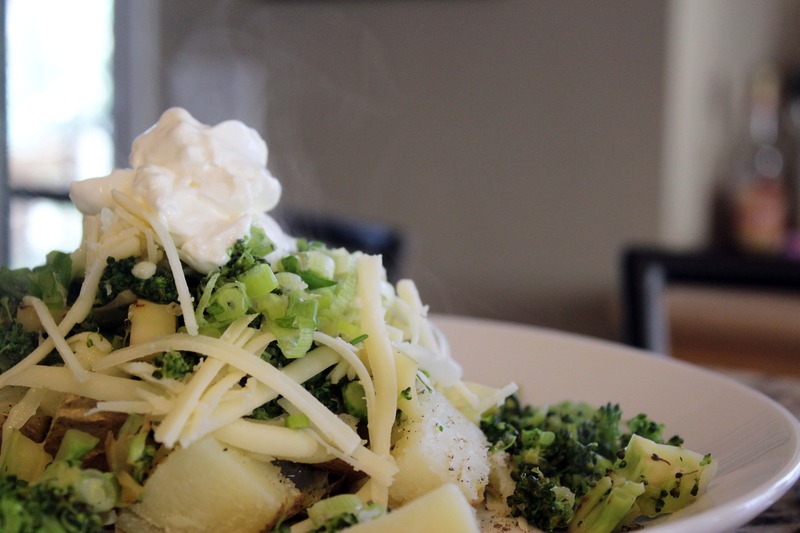 This potato fits that bill – here’s how you can make it too. 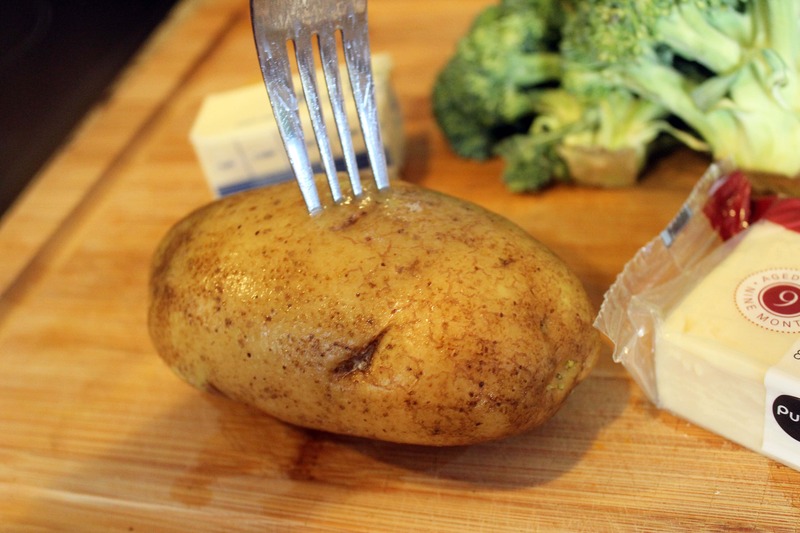 First, prick the potato all over with a fork. 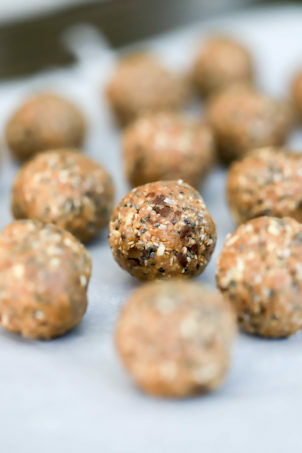 Wrap it in a clean kitchen towel and microwave it on high for 7 minutes. You can feel free to wrap it in tin foil and bake the potato in the oven at 400F for an hour, but…that kind of takes away from the fast and easy aspect of this dish. The microwave works great for potatoes! While the potato is cooking, heat a small skillet to medium heat. 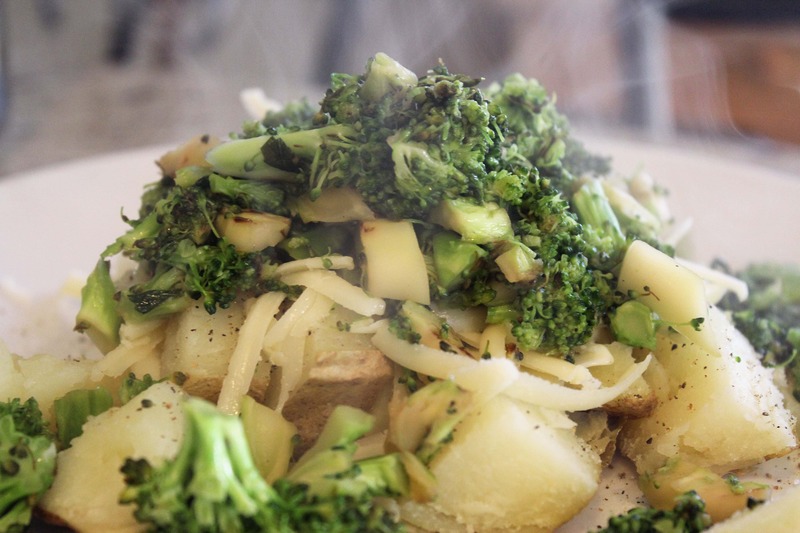 While the pan is heating up, chop the broccoli into small bits – you want 1/3 to 1/2 cup of chopped broccoli per potato. 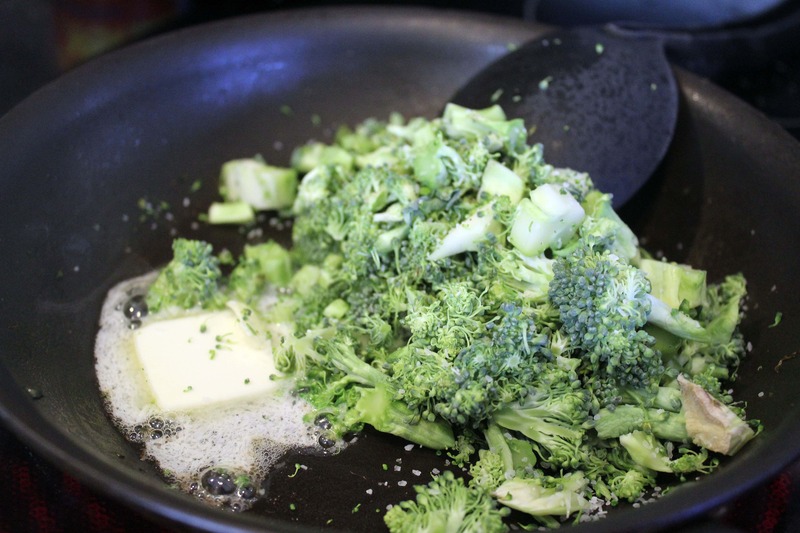 Add the broccoli and half the butter to the pan with a sprinkle of salt and pepper. 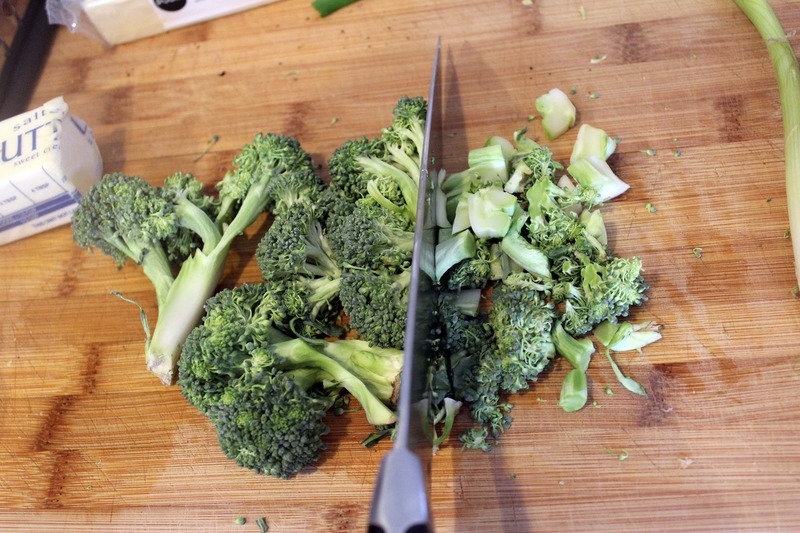 Stir every few minutes or so until the broccoli is cooked through – 5 minutes or so depending on how crunchy you like to keep your broccoli! 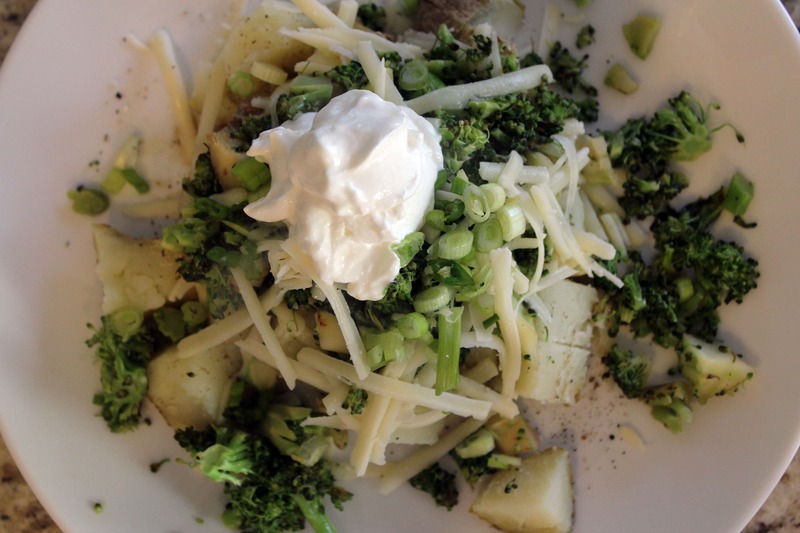 While the broccoli and potato are working, grate the cheese and thinly slice the scallion. Now, after 7 minutes in the microwave, check the potato – if it’s soft and a fork goes easily into it, it’s done! Mine took 9 minutes total but cooking time will depend on how large your potato is and how strong your microwave is. When the potato is cooked, you need to make an important personal decision. To cut or not cut the potato? I cut my baked potatoes in to little bits before serving them. It’s not as pretty on a plate, but I find that it allow for more even topping distribution, which is my main goal in life. So, there. Sorry these pictures don’t look like a magazine. I’ve gotta be me. 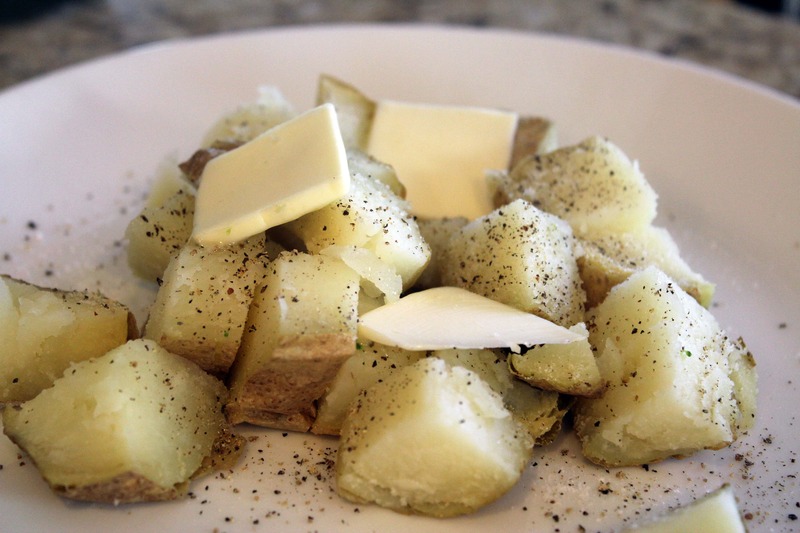 Whatever you choose, to the cooked potato, add a nice sprinkle of salt and pepper with the remaining butter. 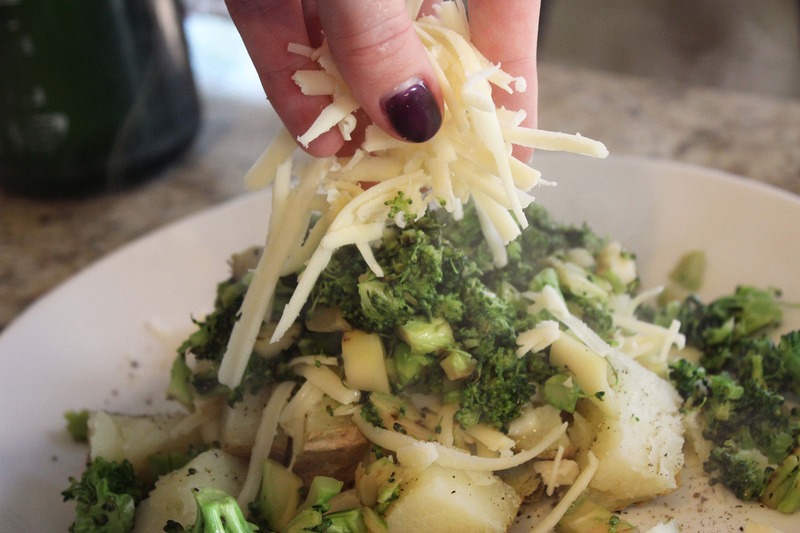 Then, top the hot potato with half the cheese and the cooked broccoli. Looks good, right? But wait, there’s more! 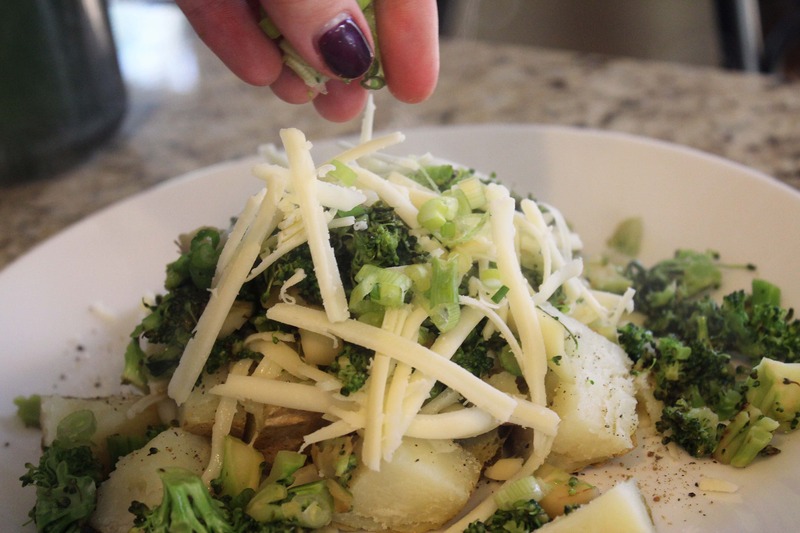 Top the broccoli with the rest of the cheese…. 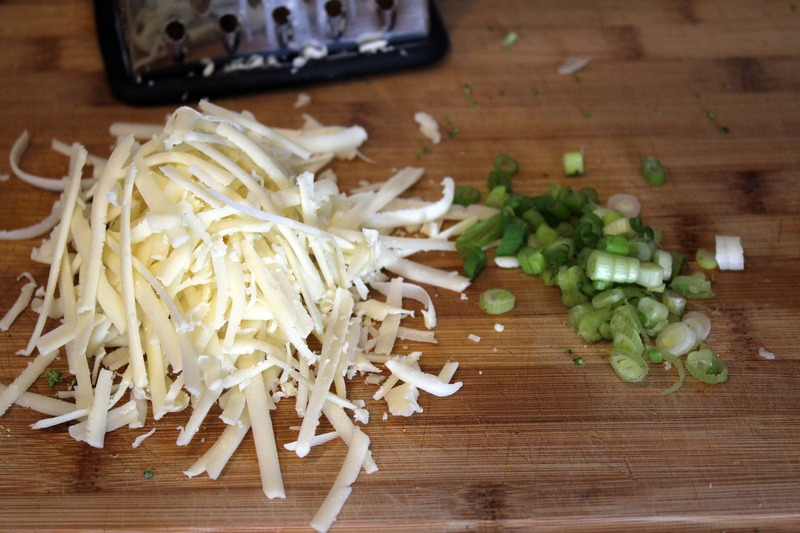 ….then scatter the scallion over the whole thing. Then add the sour cream! I got excited and added some chopped pickled jalapeno because I like things spicy. Hot sauce, fresh herbs, or anything else you like would be great on this! This was so delicious, guys. 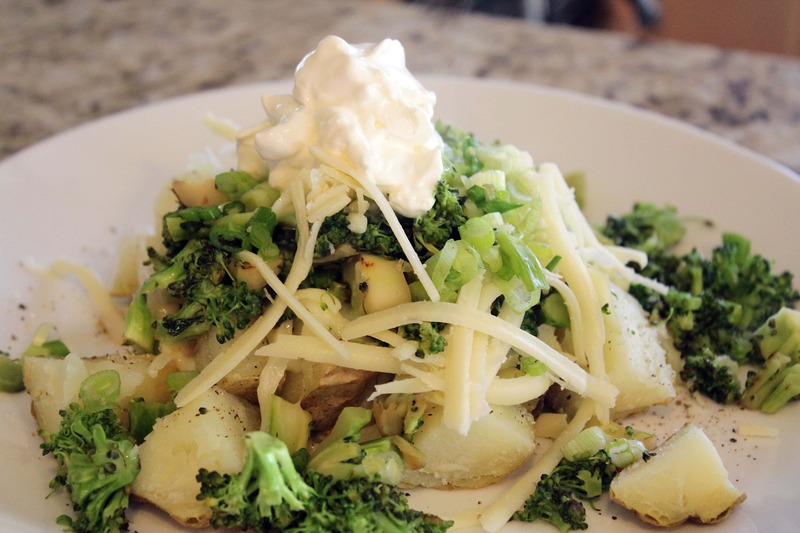 The cooked potato and broccoli, sharp cheese, fresh raw onion flavor….dayyy-um. Enjoy these! 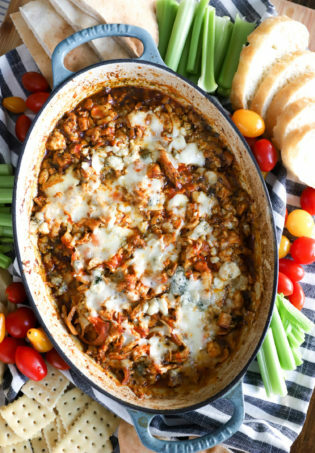 They’re perfect for a fast weeknight dinner, a lazy lunch, whatever! 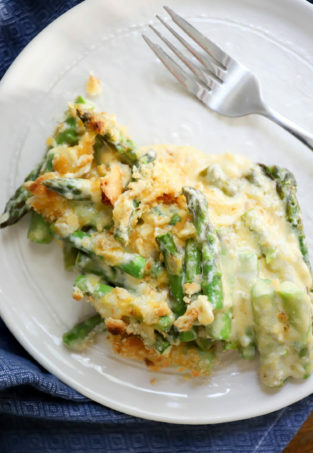 You could make small version (or split each potato in half) for a side starch and veggie all in one next to some grilled chicken or fish, too. The possibilities are endless. Yum. Submitted to Weekend Potluck. So delicious, it needs to be shared!